Calendars are the lifeblood of business operations. They always have been and always will be. One of the most common observations of successful businesses (and individuals) is they are very highly organized and have a consistent procedure. A 2017 study by PMI found that only 60% of projects actually meet their goals. The primary cause of these failures is a lack of clearly defined objectives and milestones to accurately measure progress. For business purposes, whether it be content creation, marketing, social media, or anything in between, a good calendar management solution is the key to making sure your operations run smoothly and nothing falls through the cracks. Now, that being said, there are tons of solutions on the market. Each has their own unique qualities and pertinence to your business. If you are in the research stage of investing in a tool, it can quickly become overwhelming to pinpoint the perfect program. Let’s discuss four heavy-hitter solutions currently out there and how they can be used for your specific needs. There is perhaps no greater risk to a good content strategy than poor organization. As your content marketing efforts begin to ramp up, there will inevitably come a time when you simply cannot keep track of all your operations on spreadsheets, email, in your head, or anything else you used in the early stages. Ultimately, it doesn’t matter how talented your staff is or how great your content may be; if the processes and workflows are full of holes, you are working on borrowed time. DivvyHQ is specifically designed to be used by companies who produce a high volume of content each and every day. 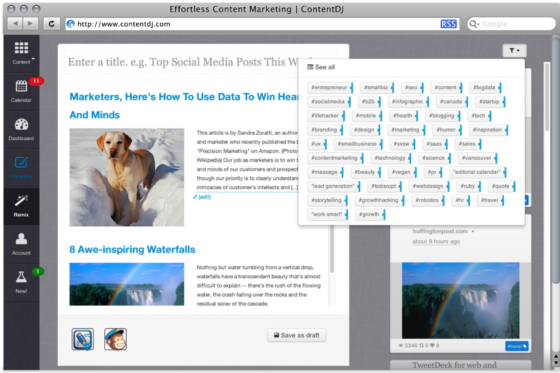 The major goal of this solution is to simplify the upfront part of the content strategy. This part of the process involves strategizing, ideation, planning, and producing. The beginning stages of content marketing are where the magic happens and brands can creatively set themselves apart from everyone else. 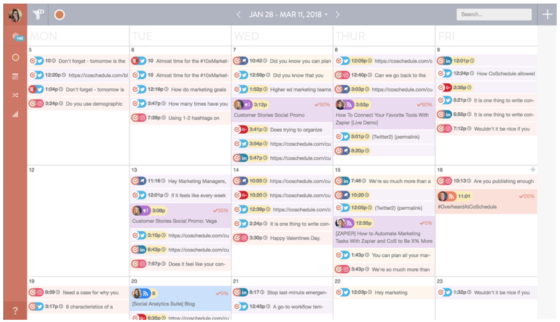 The calendar function of DivvyHQ is built to be used by content managers and producers who need to know what is on their plates, what has been completed, and what is in the pipeline. Managers can create multiple calendars to align with the departmental structure, client base, and overall content initiatives. The calendars can then be delegated to certain teams, the content channels they produce for, or the content properties they work with throughout the day-to-day. 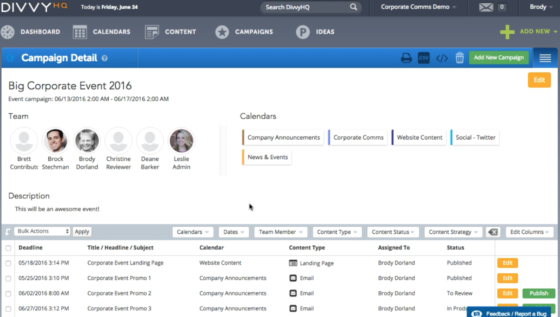 Each calendar can then be customized to fit the necessary workflow, manage content types, and any other relevant content data. 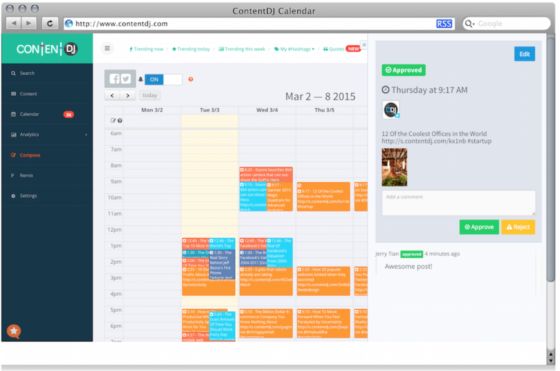 Perhaps the best aspect of DivvyHQ is how easily teams can combine their calendars and work as a single unit. For example, if there is a large promotional initiative that requires interdepartmental coordination, managers can simply create a campaign and add the necessary parties. From here, the campaign calendar will include every single detail needed from everyone involved. A content strategy is only as good as the system in place. If you are starting to get overwhelmed by projects, it may be time to invest in a tool that simplifies the finer details of the process. In the realm of content marketing, there is no denying that social media has become an incredibly prominent part of the lifecycle. This is in addition to all the other tasks which include content curation, lead capture, research, analytics, all on top of managing an editorial calendar. Even in smaller operations, juggling ALL these tasks is a challenge. For this reason, businesses and content marketing teams are wise to invest in a program that streamlines all these important components to contribute to a healthy strategy. The primary objective of this tool is to organize all the important ingredients of content marketing into a single system. This avoids the need to bounce around from platform to platform (or dashboard to dashboard) for everything you need. Designed with social media in mind, users can easily integrate their Facebook account, LinkedIn, Twitter, etc. all into a unified posting agenda. You can also color code the grid to differentiate the channels. In terms of lead capturing, Content DJ allows you to merge your MailChimp account and social media marketing tools into the system to be integrated with your main dashboard. From here, each of your lead channels can be set to feed sign-ups into your email lists or social followings. Content DJ also has a smart content recommendation engine designed to filter out the noise and serve you the most shareable content on the web. Similar to many other web monitoring programs, you can enter a keyword, brand name, or topic and see the relevant content currently getting the most engagement. 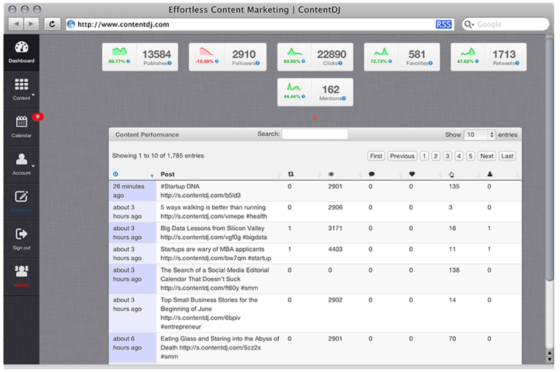 Lastly, the dashboard gives you easy access to your content analytics corresponding with your calendar. 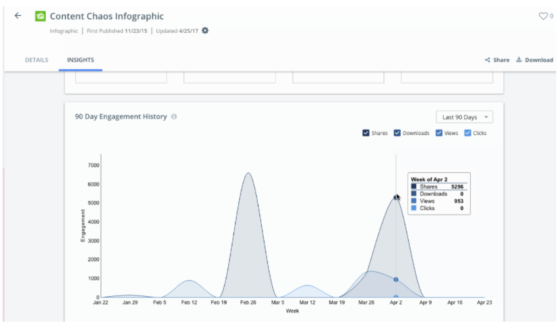 The insights tool shows you how many impressions each piece of content gets: clicks, engagement, and more. While tools like DivvyHQ specialize more on the upfront aspect of content marketing, Content DJ does a lot with the backend, which includes optimization, publishing, promoting, and analyzing, as well as simplifying the creative part of the process. For newer teams looking to improve their workflows as the business begins to hit rapid growth, Content DJ is an ideal solution. 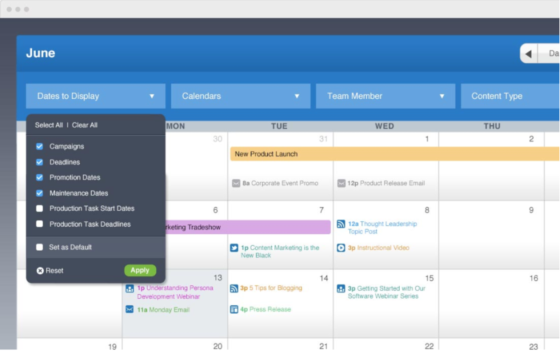 CoSchedule has been an established industry favorite for a number of years. The program prides itself on being the all-in-one solution for small business owners who understand the importance of content organization, all the way up to giant agencies that manage hundreds of clients. The solution boasts a centralized system in which WordPress users can plan marketing strategies, collaborate with each other across departments, execute campaigns, and track results with robust analytics. 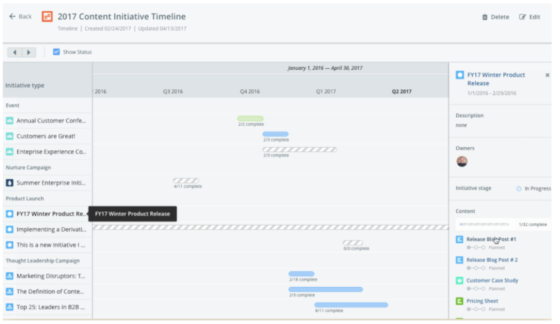 In terms of the calendar, managers and employees have full visualization of the marketing schedule and everything involved to ensure it runs smoothly. 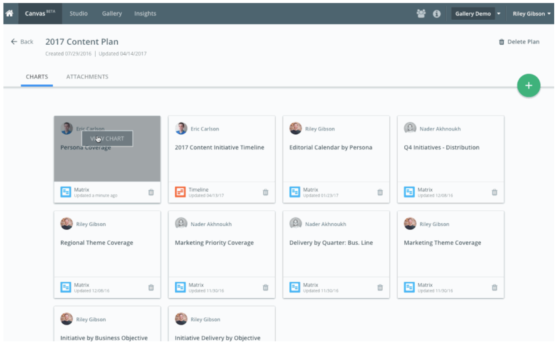 Departments can easily coordinate their schedules, solidify posting dates and times, communicate with each other, organize their content management and social media marketing efforts, track results, and much more through the intuitive dashboard. Managers are able to delegate tasks directly on the calendar grid. 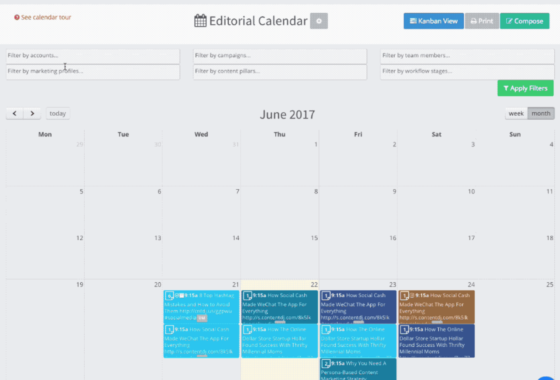 Furthermore, the calendar can be customized with color labels to categorize and prioritize projects throughout the organization. In turn, the navigation is made extremely easy. Perhaps the best part of the program is the workflow management and how easy it is to keep everyone on the same page throughout the entirety of projects. For each task, all parties involved will receive instantaneous updates on progress with a bird’s eye view of the entire campaign. 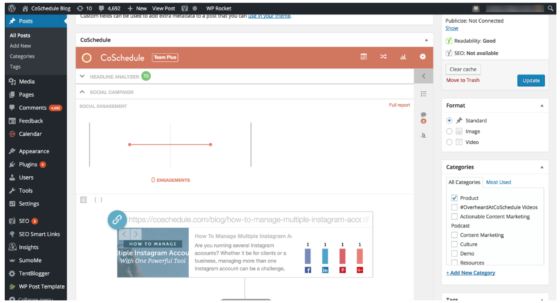 In short, there is a reason why many people consider CoSchedule to be the gold standard of calendar management solutions. Known for supporting the strategies of B2B content giants like Content Marketing Institute, Cisco, and CBS, Kapost is a platform designed to manage huge quantities of B2B content across large and diverse teams. At this point in time, every marketer out there knows just how crowded today’s content landscape is. To make an impact in the vast digital space, a content strategy needs a tool that helps them with alignment, collaboration, and accessibility to the right data sets to stay one step ahead. These are the components in which Kapost is built on. In large-scale operations, any slip up can potentially cost a detrimental amount of time, effort, and money. More importantly, a poor system can result in inconsistent messaging, which can easily turn customers off. Therefore, content management must be carried out in an airtight system. Content marketing has many different facets. This may include things like blog creation for certain aspects of the buyer’s journey, email marketing, social media, in-house branded content, and much, much more. Even though a content strategy may seem very diverse on the surface, everything works as a unit contributing to a bigger system. That being said, content calendars for these types of operations can be viewed as the glue that holds the system together. 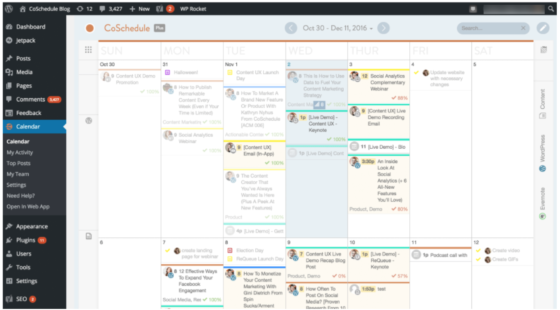 Kapost’s comprehensive calendar allows businesses to organize each and every part of their strategy and assign tasks accordingly. 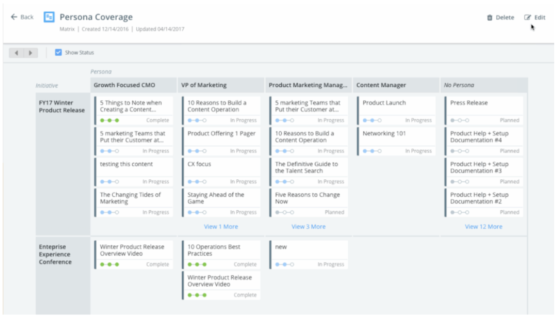 From an overview perspective, managers and team members can view the grid to see the big picture of every project and its current progress status. Additionally, each project can be viewed in a Gantt chart format to ensure no start dates or deadlines are missed. 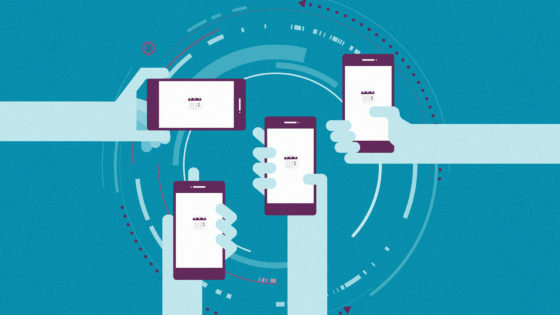 Throughout the entirety of campaigns, users can easily communicate directly through the system, exchange files, and provide updates on completion for each initiative. The data-based nature of the program allows teams to accurately gauge the results of their efforts to identify weak spots and adjust strategies as needed. B2B content marketing is a completely different ballgame than B2C. In most cases, you must appeal to a number of decision-makers throughout an organization; most of whom are very highly educated about the industry. Furthermore, professionals have very little patience for inconsistent and unfocused messaging. That being said, B2B content management must be executed at the very highest level to make an impact. Investing in a calendar management solution is one of the smartest decisions a business can make, regardless of how big or small their operation is. Some business leaders make the assumption that they do not need a system in place, especially in the early stages. However, even if you are a one-person show, getting your workflows ironed out early on forms the foundation for how work gets done now, and in the future. The earlier you adopt a solution, the better off you will be in the long run. Next articleCommunity Discussion: How Do You Survey Your Readers? How Do You Change Organizational Culture?